Old rivalries are reignited once again as Mario Kart 8 Deluxe thunders into view on Nintendo Switch. The best-selling game on the ill-fated Wii U is back, with the party favourite now bigger and better than ever before. 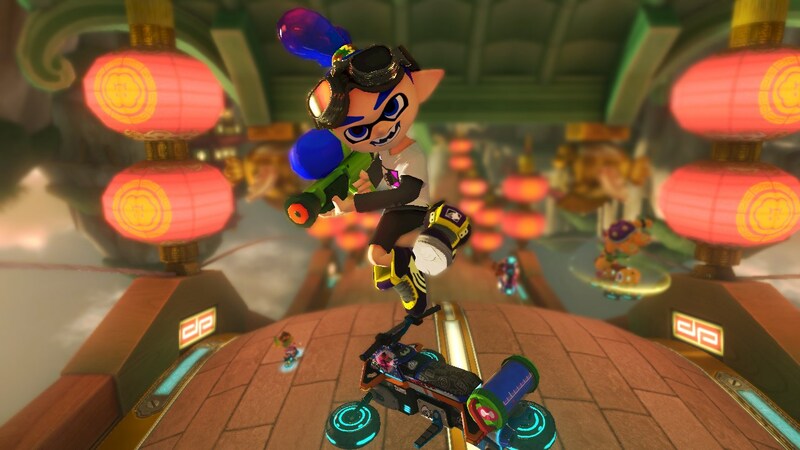 We have been hurling Red Shells, sending opponents off course with Banana skins and bopping to the Super Star music for years, but the kart racer’s power slide onto Nintendo’s new console feels particularly fresh – and that’s not a sly pun at the Inkling additions to the packed character roster. With more content than a Piranha Plant can manage to chomp in one bite, Mario Kart 8 Deluxe perfectly embodies the vision for Nintendo Switch in that the console will let you play anytime, anywhere and with anyone. I have taken it for a spin on otherwise dull train journeys, played it on the big screen at home and against colleagues in the office on the road to review, and it still continues to amaze me how adaptable Nintendo Switch and, more importantly, the experience is to each situation. That becomes all the more impressive when you remember that it was Nintendo 3DS exclusive Mario Kart 7 that we could last take on the go, making living the portable home console gaming dream all the more remarkable. Whether tackling Grand Prix solo or handing a Joy-Con to a friend to take each other on in VS Race, every session results in as much curse-ridden laughter that Mario Kart’s competitive nature has always playfully sparked. Mario Kart 8 Deluxe will let you race by land, air, sea and, thanks to anti-gravity pads, upside down when possible. 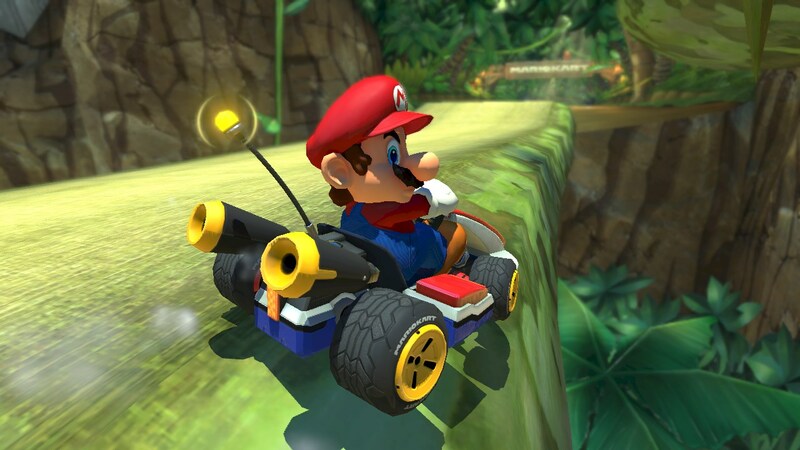 With Mario Kart 8‘s downloadable content coming loaded on the game card, that means that you can look forward to steering your way around the Mushroom Kingdom in a whopping 48 tracks. These are spread across 12 separate Cups for you to tackle, presenting a mix of both new and retro tracks. While we are talking numbers, there are more than 40 characters to select your racer from. New additions to the roster come in returning favourites King Boo, Dry Bones and Bowser Jr., Splatoon’s Inkling Boy and Inkling Girl, and Gold Mario – with the metallic moustachioed hero being the only unlockable character. When racing, players can now carry two items whether they are collected from multiple or stacked Item Boxes that line each track. There are also items that make their long awaited return: Boo, which will make you invisible to nullify incoming attacks and steal an item from another racer; and Feather, that’s useful in Battle Mode as it lets you jump high to evade attacks and can be used to steal a Balloon from a rival. Clearly keen to address the criticism that was directed at the Battle Mode in Mario Kart 8, Nintendo chose to chuck everything out the window and start again from scratch. That sees the mode completed re-tuned, now with eight battle arenas thrown into the mix – namely being Battle Stadium, Sweet Sweet Kingdom, Dragon Palace, Lunar Colony, Wuhu Town (3DS), Luigi’s Mansion (GameCube), Battle Course 1 (SNES) and Urchin Underpass. There are five Battle Modes for you to choose between, each as hilarious as the next: Balloon Battle, where you must pop the most balloons to win; Bob-omb Blast, that sees you carelessly chuck Bob-ombs around to eliminate other players; Coin Runners, in which you will aim to collect the most Coins; Shine Thief, where you must keep hold of a Shine Sprite to see a counter tick down; and Renegade Roundup, a new mode that will see each team tasked with either avoiding the law or chasing the renegades to lock them up. Those that were left disappointed by Battle Mode in Mario Kart 8 will be delighted at the returning chaos here, and the cops ‘n’ robbers-style Renegade Roundup has already become a personal favourite. Naturally, it all comes alive in multiplayer. Nintendo has always had you covered in this area, and that’s no different here. Online multiplayer supports up to 12 players, and it remains particularly easy for your Mii to wander into a lobby to join others. I haven’t encountered any issues with matchmaking or races, even if my driving skills aren’t yet strong enough to lead Baby Luigi to victory. Voice chat is the only real missing piece in this karting puzzle, but we can hope that isn’t too far away given that the plan was for the mobile app to land in time for Splatoon 2. And then, in local multiplayer, Nintendo Switch enters its own. 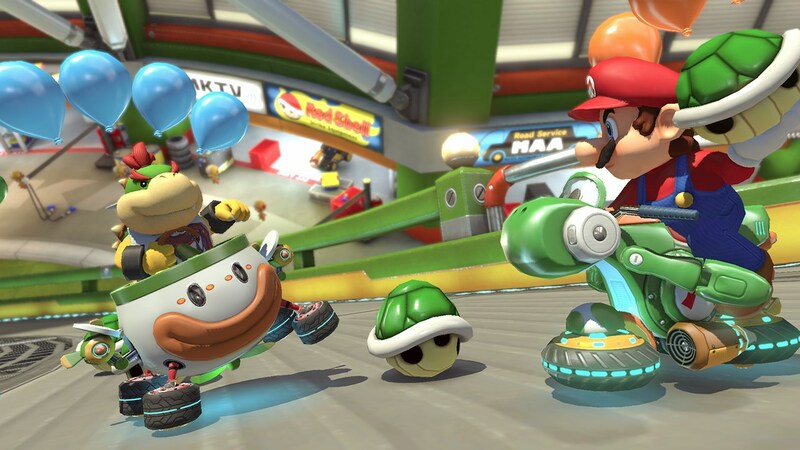 Whether simply playing split-screen and sharing your Joy-Con with a friend or wirelessly connecting multiple consoles to play eight player races, this is where the kart racer truly shines. There’s even LAN Play that presents the chance to hook 12 consoles together, which makes for a neat addition. Mario Kart has never been more accessible, either. Smart Steering will gently nudge players around each track whenever they veer off-course and will be a tremendously encouraging help to less experienced racers. An Auto-accelerate option has also been added, which, combined with Smart Steering can actually let Mario Kart 8 Deluxe play itself. It’s welcome, though, in meaning that players are no longer required to hold the A Button to accelerate all the time – which can, hopefully, also help make the game more accessible to those that suffer from a disability. With the Joy-Con and Nintendo Switch Pro Controller lending many control options, it was the Joy-Con Wheel that came as a surprise after my admitted struggles with wrestling the Wii Wheel into submission in Mario Kart Wii. Far more responsive due to the improved tech housed in the Joy-Con, it may even be enough to convert those with an aversion to motion controls. amiibo support makes a return, with select characters unlocking racing suits that your Mii can wear. This still doesn’t feel particularly meaningful, a minor reward for those that have loyally built their amiibo collection. With colourfully sumptuous visuals and a jazz-infused soundtrack that energises your time with the game, this all builds toward delivering the definitive Mario Kart experience that you’ve been waiting for. Mario Kart 8 Deluxe captures that rare magic, an unbeatable experience with friends and family that perfectly demonstrates how the concept that has driven Nintendo Switch is a complete game changer. Thundering over the finish line, that helps this to effortlessly rank as the best Mario Kart game ever made.